which can model the production, consumption, and non-farm labor supply ... while payments come from ES users, government revenues, or third-party donors. 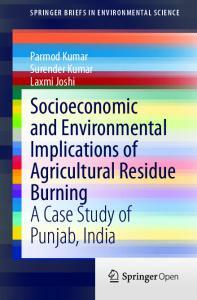 SpringerBriefs in Environmental Science present concise summaries of cutting-edge ... Open Access This book is distributed under the terms of the Creative Commons ... ISBN 978-81-322-2014-5 (eBook) .... 4.3.8 Incorporation of Paddy Straw in Soil . ..
margin, farm policy, imperiled species, land use, land-use change, land quality, nutrient ... Dale Simms for editorial assistance and Wynnice Pointer-Napper for. Mar 14, 2016 - Land-Cover Changes: A Case Study of Wuhan City, China ... 1 School of Environment, Resources and International Trade, Hubei University of Economics ......  K. C. Seto, M. Fragkias, B. GÃ¼neralp, and M. K. Reilly, âA meta-. causes respiratory problems and increases the fog ... stabilization of organic substrate under conditions that ... Under appropriate conditions bacteria degrade. related to travel behavior, especially modal choice (Cervero and Radisch, 1996: ... Both analyses are presented in the next two sub-sections. ... TZs of Pimentas, Rodovia Presidente Dutra and Guarulhos; (2) the ABCD region; and (3) the. Jul 3, 2004 - The LCU recognises private, communal, and state ownership (Art. 78(3) LCU). All land, .... shall be realised through a land auction (Art.16 LLL). a b s t r a c t Agricultural land conversion for urban development is a major process in the vicinity of many cities in Vietnam. This causes problems for the fabric of local society. In this paper, we evaluate four agricultural land’s acquisition projects in two areas (Hoai Duc district and Thanh Oai district) in Hanoi, Vietnam to examine two primary questions: (1) how do farmers obtain any economic beneﬁt from urban development projects? And, (2) how are socio-economic livelihoods of the farmers effected by land conversion? The investigation relied on a market land price’s survey using a structured-interview method, in which 395 land-acquired households were randomly selected. The responses indicate that there are unequal beneﬁts among the various stakeholders. On average farmers tend to beneﬁt the least. Although the farmers have the possibility to transform their agricultural livelihood into a non-agricultural one with probably a higher income, they are actually faced with many difﬁculties in maintaining non-agricultural activities, in ﬁnding stable alternative livelihood activities, and in using the compensation for investments. © 2016 Elsevier Ltd. All rights reserved. ∗ Corresponding author at: VNU-University of Science, No. 334, Nguyen Trai Road, Thanh Xuan District, Hanoi, Vietnam E-mail addresses: [email protected], [email protected] (T.H.T. Nguyen). 1 These authors are equally contributed to this work. http://dx.doi.org/10.1016/j.landusepol.2016.02.032 0264-8377/© 2016 Elsevier Ltd. All rights reserved. responsibility of the investor. In another study in a suburban village of Hanoi, Nguyen (2011) also analyzes the problem of job change, the ability to preserve traditional craftsmanship and the risks due to income instability and the use of ﬁnancial resources. This paper presents an in-depth analysis on the impact of both conversions of agricultural land policy and of land acquisition. Although we zoom in to conversion processes in Vietnam, the ﬁndings of this study is signiﬁcant for other countries where rapid urbanization and land conversion takes place. In this study, we evaluate four agricultural land acquisition projects in two areas with different urbanization rate (Hoai Duc district, at high urbanization rate, and Thanh Oai district, at low urbanization rate) of Hanoi to examine two primary questions: (1) how do farmers whose land were acquired obtain economic beneﬁts from urban development? This question has not been emphasized in previous comparable studies on land use conversion; and (2) how does land conversion affect socio-economic livelihoods of the farmers (income, employment.,)? Speciﬁcally, the study aims at comparing situations in livelihood and employment changes of people whose land were acquired for urban construction projects with those whose land were acquired for industrial construction projects. The study focused on famers whose agricultural land was acquired. They were the most affected ones when the agricultural land transition occurred, because of their dependence on agricultural land and because of the change in their village life style which they had been accustomed to through generations (Ngo, 2012). In order to address these two questions, a bottom-up approach was employed. This involves local people’s participation in the research, collecting views and opinions of communities, and holding household interviews. This mixed method was considered most effective for this purpose. 2. Background and context 2.1. Agricultural land conversion in Vietnam and Hanoi To meet the goals of industrialization and urban development in the period 2000–2010, 636,000 ha of agricultural land were converted to non-agricultural uses in Vietnam (GDLA, 2010b). In Hanoi, the conversion of agricultural land to urban land took place at a rapid pace. Urban area increased by 4 times from 1995 to 2003, from 47.22 km2 in 1995 to 185.72 km2 in 2003 (Duong et al., 2014). The conversion process occurred mainly in the suburban districts, such as Tu Liem, Thanh Tri and Gia Lam (Tran et al., 2005). This despite the fact that these regions had highly suitable soils for agriculture (Thapa and Murayama, 2007) and were considered as “important provider of cereal production (meat, vegetables and ﬂowers) for the inner city.” (Pham et al., 2014). Since 2008, after the expansion of the Hanoi administrative boundaries, the process rapidly continued, spreading to surrounding rural districts, particularly in Hoai Duc district (Tran, 2013). A series of new urban centers, parks and industrial zones and infrastructure appeared, replacing the rice ﬁelds and rural villages. change, it leads to new opportunities and challenges for the livelihood of people (IRP, 2010). The acquisition of farmer’s agricultural land is regarded as a considerable livelihood change (or maybe it is a “shock” for their livelihood), because they are forced to change their primary livelihood activities (by crop intensiﬁcation or conversion to more valuable, more suitable crops in remaining agricultural land) or to new livelihood activities (Duong et al., 2013; Dung, 2010; Van den Berg et al., 2003; Tran and Steven Lim, 2013). At this time, the livelihood strategies of the people, i.e. the way they access and use of the funds in the context of economic, social, political and environmental conditions (IRP, 2010) play a decisive role for stabilizing their lives, also because there is generally inefﬁcient support from the State or the investors in many places (Nguyen, 2009). 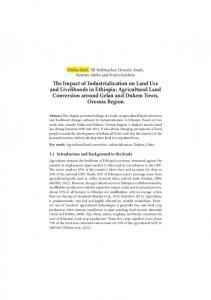 eﬁciary and the users of acquired land has not been mentioned yet (WB, 2012). tionnaires. Based on the lists of farmers in the study areas provided by the committees of Land Clearance and Compensation of Thanh Oai district and Hoai Duc district, 410 households were randomly selected for interviews. The ﬁrst interviews were carried out in May 2014, in Kim Chung commune, Hoai Duc district. The second round of interviews were carried out in June, 2014 in Cu Khe, Bich Hoa communes, Thanh Oai district. After checking the collected data, 15 response sets did not prove reliable and were eliminated. So, ﬁnally 395 response sets could be used as a basis for further data processing and analysis. Table 2 describes these results. The structured interviews focused on basic information of household members, the respective land areas, the type of livelihood conversion, the amount of compensation and support money, the coping and re-investment strategies after having received the compensation, and personal views and opinions about their new living and production environments. 6. Results 6.1. Responsibilities and relationships between stakeholders in agricultural land conversion In all of the four selected projects, the primary stakeholders during the conversion process are the State, project investors and farmers (land losers). The responsibilities of the three parties are shown in Figs. 3 and 4. Fig. 3. Responsibilities of stakeholders in agricultural land acquisition for new residential construction project (for economic development). Fig. 4. Responsibilities of stakeholders in agricultural land acquisition for new industrial development project (for public beneﬁt). of the State (2.52 million/m2 and 0.25 million/m2 ) and farmers (0.13 million/m2 and 0.16 million/m2 ). In the Lai Xa industrial project in Thanh Oai district, a similar situation occurred. The amount of compensation which the farmers received (0.13 million VND/m2 and 0.05 million VND/m2 ) from the State was far lower than the overall beneﬁt. The State can directly get beneﬁt from entrepreneurs by leasing ofﬁce buildings or land (annual or long-term). With low rent fee (as compared to the actual market price) that they have to pay to the State, the entrepreneurs were highly beneﬁting from the projects. Besides, according to the support policy of three construction projects, Kim Chung-Di Trach, Lai Xa and Thanh Oai, each household only had to pay an amount of money (at quite low price) to receive a service land parcel, by 10% area of their total acquired agricultural land. This policy aims to not only support the farmers in job rearrangement but also to involve them as a beneﬁciary of the projects. However, after years of land acquisition, service land for people has not been allocated yet due to actual policy implementation. This situation exacerbated the conﬂict between the real interests of the local farmers and the responsibility of investors. From this case, we found that, the farmers were the most disadvantaged ones while investors got the highest beneﬁt. 6.2.2. Value of other beneﬁts (non-physical) Besides the payment of compensation and support in cash, the other supports for farmers included vocational training, job rearrangement in urban area or new industrial zone. However, the responses analysis showed that only few people (2.1% of land losers) were able to join the local vocational training (such as clothes manufacturing,. . .). Moreover, the content of the training was not perceived as suitable for the demands of the local people. The proportion of households whose members have been employed as workers, factory guards and cleaners in industrial zone was only 6.3% of interviewed households in Thanh Oai Industrial Zone and 5.6% households in Lai Xa Industrial Zone. Table 3 Economic beneﬁts of all parties in land conversion projects. Source: (Cienco, 2008; GDLA, 2010a; HNPC, 2010). hold (1983 m2 /household), most of households left their remaining lands unused. Table 4 provides an overview. Another problem which emerged under the inﬂuence of the construction works was that the agricultural production of people in Thanh Oai Industrial Zone was no longer the same as before. 74.8% of interviewed households complained that irrigation canals had been damaged, 62.2% stated that pollution lead to the increase on plants and human diseases. In the other projects, farming households have also found the same difﬁculties in cultivation. 6.3.2. Strategies in transforming livelihoods One of signiﬁcant consequences of agricultural land conversion in this research is the livelihood changes from agricultural activities to non-agricultural activities. It was only an exception in Thanh Oai Industrial Zone, where farming households were still able to maintain their agricultural works on remaining lands (cultivation and livestock and poultry). Whereas, in most cases, land losers had to convert their livelihoods due to the big loss of agricultural land area. In these cases, farming labors have mainly engaged in trade, services and informal-paid works (Table 5). Although facing the same socio-economic shock (from being expelled from their agricultural land), the farmers have got different opportunities in livelihood conversion due to their dissimilarities on ages and ﬁnancial capitals. It was obvious that those with a higher education level, at young age or obtaining good ﬁnancial capital, could ﬁnd ofﬁcial jobs (like being white collars (civil servants, teachers, state company’s staffs,. . .), blue collars (workers) or owning their own small business, services,. . .). Middle-aged workers, from 35–50 years old have found it hard to get such these jobs. The majority of them has chosen to engage in private-owned trade and services. A number of laborers of over 50 years old, who could convert their livelihood, accounts for only 13%. Among them, 60% can only change their agricultural activities into informally paid jobs. Moreover, in spite of still keeping agricultural land, many labors whose land is acquired for the Thanh Oai Industrial Zone still intend to change into non-agricultural activities to get higher income and reduce risks from agricultural land decrease in the urban development process (see Table 6). Note: 1*: before land acquisition; 2*: after land acquisition. Note: 1*: number of labors transited to white collar, blue collar, and trader or service providers; 2*: number of labors transited to part time or daily hired-labor (informal paid works). Table 7 Number of labors has not yet found suitable jobs by age structure (unit: people). Table 8 Number of labors has not yet found suitable jobs divided by education level (unit: people). Note: 1*: percentage of total interviewed households (unit: %); 2*: average expense money/household (1000VND). were the ones who got the most beneﬁts from the urban development project as they received high compensation. It was a reason to explain that why the average money they spent for many types of expenses were dozen times more than that of households in the other projects. while 26.8% inversely expressed that their income was reduced because of the difﬁculties in occupational conversion and agricultural production maintenance. However, the main source of anxiety for many of them (41.7% of all households) was that land and water for cultivation were becoming increasingly polluted, which could lead to higher rates of pests and diseases. For land losers in Thanh Ha-Cienco 5, the situation was completely different, as almost the entire area of arable lands had been reclaimed; they were pushed to convert their livelihoods. 55.5% of households negatively felt that their income had been reduced due to land acquisition, and only 13.3% gave opposite opinions. Similarly, 56.3% of total interviewed households complained that they could not access opportunities to convert their careers. The situation was worsening that many labors in this project were currently unemployed and were not able to ﬁnd jobs. However, many people gave positive opinions for the improved landscape, environment, accessibility to health services and education,. . . 48.3% interviewed households in Kim Chung-Di Trach also criticized the consequence of aftermath land conversion that local environmental quality decreased as growth of rats, bugs, and ﬂoods. In references to the income, positive responses accounted for 38.5%, while negative responses covered 30.8%. Regarding to the livelihood conversion, 30.8% of the total households said that they had better chance to change their careers, and only 16.9% gave the opposite opinions. And again, most of people agreed that the landscape, the environment, accessibility to health services, education and security were signiﬁcantly improved. For households in Lai Xa Industrial Zone, their biggest problems after land conversion were increasing environmental pollution (55.6%) and the decreasing security (72.2%) (Increasing social problems, such as: theft, addictions, gamble. . .). The percentage of households seeing better chances in livelihood conversion was almost equal to the percentage of households feeling worse future. There was one other thing in common among households in Kim Chung-Di Trach project, Lai Xa and Thanh Oai industrial zones, that most of them was expecting to receive service lands in the urban development projects as the state had promised to allocate for them. The implementation of land allocation had not been done even though the projects had started 10 years ago. 7. Discussions 7.1. Need to adjust the balance of economic beneﬁt share between the State, investors and farmers in agricultural land conversion projects This study reveals that in fact, project investors are the one obtaining highest beneﬁt from the agricultural land conversion. Meanwhile, the farming households should suffer several vulnerabilities from losing agricultural land, jobs and ability of keeping agricultural production, in spite of getting more opportunities in increasing ﬁnancial capital and evolving in non-agricultural activities. It is indicated that investors are enjoying great proﬁts, but takes less responsibility for local livelihoods. In several projects, land had been acquired, but local people have not offered new careers and support for stabilizing their livelihood. In two cases of Lai Xa and Thanh Oai industrial zones, only 5–6% of total farmers were employed in these zones. It is an evidence to explain for the recommendation of World Bank on land policy that “the Land Acquisition and allocation methods for economic purposes often cause inequity in sharing interests between land users, investors and State. 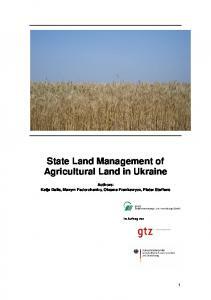 Inefﬁcient land use, corruption and lasting land-related appeal are main issues. This implementation does not guarantee the right of the people, and it is contrary to the Constitution of 1992” (WB, 2012). people, causing them to prolong their insecure situation. At the same time, where the change of livelihood was actively supported during the conversion of agricultural land use from agriculture to diverse non-agricultural occupations, the income of households has increased. However, there are still difﬁculties in maintaining farming on the remaining agricultural land, in ﬁnding stable livelihood activities, and in using compensation for investment. In some projects where entire agricultural land is acquired such as Thanh Ha-Cienco 5 project, policy manner should be taken into consideration, when entire land is claimed in exchange for large amount of compensation. The ﬁndings of this study are not only insightful for Hanoi in particular or Vietnam at large, but also for other countries where signiﬁcant and rapid conversion of land takes place, and where similar contrasting forces of stakeholders are present. It is crucial in such cases that not only compensation policies are fairly and effectively implemented, but it is perhaps even more crucial that effective and appropriate support strategies for local farmers whose livelihood is signiﬁcantly changed in the conversion process are constructed. Without such support strategies the potential for further conﬂicts may increase, leading to a decrease in sustenance of the conversion process. Moreover, the degree to which beneﬁts are shared may need to be carefully looked into. The main victims of the land conversion, in most cases the local subsistence farmers, tend to receive much lower beneﬁts than the main winners from the conversion process, the investors. If these are not carefully looked into, it may lead to possible resistance and stress in society, and moreover, lead to considerable economic inequality. Acknowledgement This research is funded by Vietnam National University, Hanoi (VNU) under a project number QG.TÐ.13.08. References ADB, 2007. Making Markets Work Better for the Poor Markets and Development Bulletin. Hanoi. Azadi, H., Hol, P., Hasﬁati, L., 2010. Agricultural Land Conversion Drivers: a Comparison between Less Developed, Developing and Developed Countries. John Wiley & Sons Ltd. Chambers, R, Conway, G., 1992. Sustainable rural livelihoods: Practical concepts for the 21st century IDS Discussion Pape. Brighton. Chan, N., 2003. Land acquisition compensation in China—problems and answers. Int. Real Estate Rev., 136–152. Cienco, 2008. Preliminary report on Thanh Ha A,B—Cienco 5 residential project (in Vietnamese). Duong, D.D., Le, T.N., Nguyen Thi, D., 2013. Difﬁculties in transition among lilivehoods under agricultural land conversion for industrialization: perspective of human development. Mediterr. J. Soc. Sci. 4 (10), 259–267. Dao, T.T., 2012. Urbanization and Periurbanization in Hanoi. Ho Chi Minh City General Publishing House, Ho Chi Minh City. DFID, 2000. Sustainable Livelihoods Guidance Sheet. Duong, N., Miguel, Castrence, T.M., Jefferson, Fox, James, Spencer, Qi, Chen, 2014. Built-Up Area Change Analysis in Hanoi Using Support Vector Machine Classiﬁcation of Landsat Multi-Temporal Image Stacks, Environment, Population and Health Series, East-West Center Working Papers, vol. 1. People Committee of Hoai Duc district, 2012. Land clearance in Hoai duc district during 2004–2011: practical experiences. Dung, N.M., 2010. Farmers’ Coping Strategies for Sustainable Livelihood under the Impacts of Industrializaion Projects in Rural Area (a Case Study of Van Duong Commune in Red River Delta of Vietnam) EADN working paper, vol. 47, p. 43. FAO, 2011. The State of the World’s Land and Water Resources for Food and Agriculture − Managing systems at risk. Food and Agriculture Organization of the United Nations. GDLA, 2010a. Land administration: international experiences Ha Noi. GDLA, 2010b. National Landuse intentory Ha Noi. Hans-Dieter, Evers, Korff, R., 2003. Southeast Asian Urbanism. Lit Verlag. HNPC, 2010. Land value 2009–2010. Ha Noi: Hanoi People Committee. Hoang, H.P., 2012. North An Khanh Satellite Town and the Search for a Suitable Urban Structure for Hanoi. Ho Chi Minh City General Publishing House, Ho Chi Minh City. UNDP, ISRD, IRP, 2010 Guidance note on Recovery Livelihood. Cling, Jean-Pierre, Nguyen, H.C., Roubaud, M.R. Francois, 2010. Urbanization and Access to Labour Market in Vietnam: Weight and Characteristics of the Informal Sector. Ho Chi Minh City General Publishing House. Kelly, P.F., 1998. The politics of urban-rural relations: land use conversion in the Philippines. Environ. Urban. 10 (1). Kelly, P.F., 1999. Everyday Urbanization: the Social Dynamics of Development in Manila’s Extended Metropolitan Region. Joint Editors and Blackwell Pulishers. Kontgis, C., et al., 2014. Monitoring peri-urbanization in the greater Ho Chi Minh city metropolitan area. Appl. Geogr. 53, 377–388. Leaf, M., 2002. A Tale of Two Villages: Globalization and Peri-Urban Change in China and Vietnam. Cities, 19(1), 23–31. Guo, Li, Jonathan Lindsay, P.M.-F., 2008. 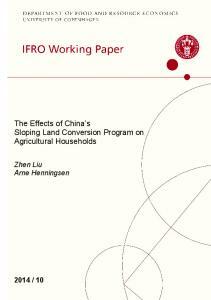 China: Integrated Land Policy Reform in a Context of Rapid Urbanization Agricultural and Rural Development Notes: Land Policy and Administration of World Bank, p. 3. McGee, T., 2009. The Spatiality of Urbanization: the Policy Challenges of Mega-Urban and Desakota Regions of Southeast Asia UNU-IAS Working paper No. 161. Ngo, V.L., 2012. Periurbanization and its impacts on society and culture. In: Ton, N.Q.T., Fanny, Q., Claude, de M., Nguyen, Q.V., Le, V.N., Truong, H.T. (Eds. ), Trends of Urbanization and Suburbanization in Southeast Asia. Ho Chi Minh City General Publishing House. Nguyen, T.H.T, 2011. Conversion of Agricultural Land and its Impact on Peasants in Hanoi Suburbs during Rapid Urbanization: A Case Study of Me Tri Commune. 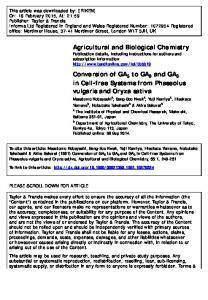 Jinbunchiri Journal, the Human Geographical Society of Japan, 63(2), 1–17. Nguyen, V.Q., 2005. The Impact of Urbanisation on Agriculture in Hanoi—Results of Interviews with district and municipality ofﬁcials. Nguyen, V.S., 2009. Industrialization and Urbanization in Vietnam: How Appropriation of Agricultural Land Use Rights Transformed Farmers’ Livelihoods in a Peri-Urban Hanoi Village? vol. 38, EADN working paper. Parliment of Vietnam, 2013. Land law 2013. Ha Noi. Schneider, A., 2012. Monitoring land cover change in urban and peri-urban areas using dense time stacks of Landsat satellite data and a data mining approach. Remote Sens. Environ. 124, 689–704. Thapa, R.B., Murayama, Y., 2007. Land evaluation for peri-urban agriculture using analytical hierarchical process and geographic information system techniques: a case study of Hanoi. Land Use Policy, http://dx.doi.org/10.1016/j.landusepol. 2007.06.004. Thuo, A.D.M., 2013. Impacts of urbanization on land use planning and environment in the Nairobi Rural-Urban Fringe, Kenya. Int. J. Scie. Technol. Res. 2 (7). Tran, D.V., Nguyen, V.Q., Nguyen, V.D., 2005. Rural-urban land use changes in peri-urban Hanoi. 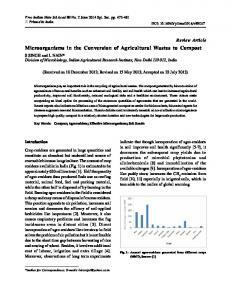 Paper presented at the EU 5th Framework INCO2 funded research project, Ha Noi. Tran, Q.T., 2013. Livelihood strategies for coping with land loss among households in Vietnam’s sub-urban areas. Asian Soc. Sci. 9 (15). Tran, Q.T., Steven Lim, M.P.C., 2013. Responding to Loss of Farmland: the Role of Social Capital. The Senshu Social Capital Review (4), 25–44. Pham, V.C., Pham, T.T.H., Tong, T.H.A., Nguyen, T.T.H., Pham, N.H., 2014. The conversion of agricultural land in the peri-urban areas of Hanoi (Vietnam): patterns in space and time, J. 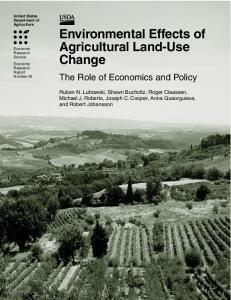 Land Use Sci., http://dx.doi.org/10.1080/ 1747423X.2014.884643. Van den Berg, L.M., Van Wijik, M.S., Pham, V.H., 2003. The transformation of agriculture and rural life downstream of Hanoi. Environ. Urban. 1, 35–52. Vu, H.P., 2006. Impacts of Urbanization in a Peri-Urban Area of Hanoi: the Voice of Affected People. Vietnam Social Sciences, 5(115). WB, 2012. 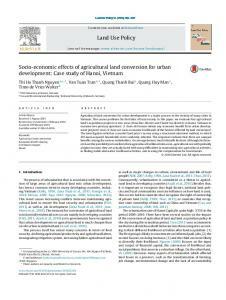 Land law for sustainable development in Viet Nam, p. 23, Ha Noi. Francis, Zana Naab, Romanus, Dogkubong Dinye, Raphael Kasim, Kasanga, 2013. Urbanisation and its impact on agricultural lands in growing cities in developing countries: a case study of Tamale in Ghana. Modern Social Science Journal, 2(2), 256-287. Report "Socio-economic effects of agricultural land conversion ..."